In a small mixing bowl, beat egg whites until stiff; set aside. Beat egg yolks; add milk and melted butter. Sift dry ingredients together; add egg yolk mixture and mix until smooth and fold in blueberries. Gently fold in beaten egg whites. 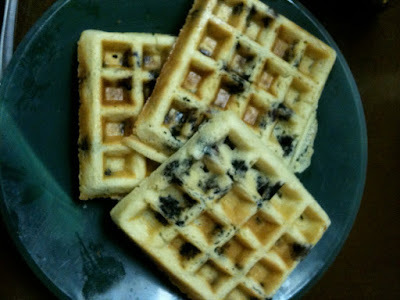 Bake in a hot waffle iron. Makes about 6-8 blueberry waffles.